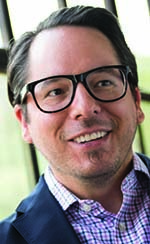 The architectural design firm HKS Detroit has hired Alexander Briseño as its new vice president and design director. In his new position, Briseño will be responsible for the company’s Detroit area commercial practice. Briseño, of Grosse Point Park, has been involved with building projects in the Americas, Asia, Europe, and the Middle East. With 20 years of experience, he has worked with clients including Toll Brothers City Living, Lefrak Organization, Marriott, Hyatt Regency, Avenues The World School, and more. He was also a senior associate at Arquitectonica in New York, and has spent nine years with Perkins Eastman in New York. Briseño is a graduate of the University of Michigan.